don't get caught: Don't just get your timing straight. Explain it. Timing may be everything, but it's not always obvious, particularly to those outside your organization. More and more, I'm seeing a need for companies and organizations to be more, rather than less, transparent about the timing behind their announcements. .
Reporters pay particular attention to your timing, so you can expect them to flag anything that seems odd, out of kilter, coincidental or exceptional about the "when" of your announcements...sometimes, in graphic ways. 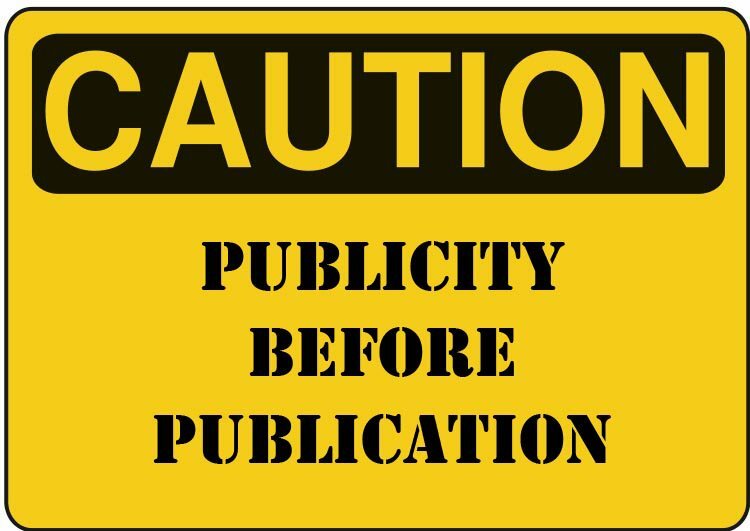 New York Times Dot Earth blogger Andrew Revkin came up with the sign above left to flag research that is being promoted and released prior to publication in a peer-reviewed journal--skipping a significant quality-assurance step in the scientific process. He rolled the sign out for a Norway Research Council announcement on climate change research, but notes that he "will use it when needed." In his column, he shares an email he sent asking for clarification: Was this similar to a consensus report, such as those issued by the U.S. National Academy of Sciences? That might be one reason this study wasn't yet published in a journal, but if so, it's a reason that belonged in the announcement. 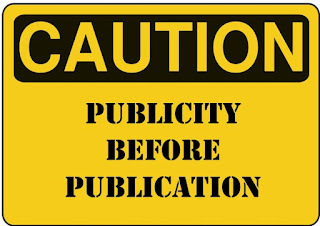 Yesterday, Revkin expanded on this theme of publicity before publication in a second post, parsing new information that certainly should have been included in the initial announcement, at a minimum. Didn't the White House understand the significance of that date, the anniversary of the attacks on the World Trade Center and the Pentagon? Discussants walked us through the calendar, and planning process, just as any smart communicator would do. The law requires the report to be made by September 15; the Jewish holiday of Rosh Hashanah falls on the 13th and 14th; and Labor Day, September 3, is a federal holiday that falls the week prior. The conclusion: It's a crowded calendar, not an intentional slight, that prompts the schedule this time. Required by law: Some public announcements are determined--right down to the date and the hour and minute--by court orders resulting from lawsuits. Your legal requirement to announce might be prompted by a court, by legislation or by executive order. Having handled dozens of federal EPA announcements forced by court order, I can attest that legal requirements are an important determinant in many news releases, and should be identified. Required by propriety: Waiting to announce the names of the dead until their families have been notified might be the most familiar example, but as in the example above, religious holidays and other solemn occasions might prompt a timing change. Required by the process: Whether it's the scientific process, a regulatory or legislative process, or some other type of deliberation, explaining the method and the steps taken and yet to be taken can alleviate misunderstandings and assumptions. Don't be afraid to say "we don't know yet, and that's why we're taking the time to do it this way," if the answer is just that simple. If you're skipping a step, adding extra steps, or otherwise mucking with the process, explain why. Required by reviews: Similarly, if your work product's subject to a review by an external group, or a vote, or some other approval process, describe it and the deadlines to come. One timing factor--a made-up one--is worth taking out of your toolbox and retiring. Used to be that big organizations, including government agencies, got in the habit of releasing not-so-good news on Friday afternoons, when they were less likely to garner coverage and attention over the weekend. Take out the trash Fridays were memorialized in an episode of West Wing, but have become tougher to pull off in the Internet and Twitter ages. If you haven't updated your tactics to avoid this one, it's time to do so. For starters, Fridays aren't the black hole of information that they used to be. For another, the news media is on to this one, and has been for a long time. You're not really fooling anyone. If you do have other timing factors outside your control, saying so may be your best bet. Don't be surprised if you need to repeat them a few times, even if it's a coincidence. Consider it a transparency factor, and build it into your communications plans.